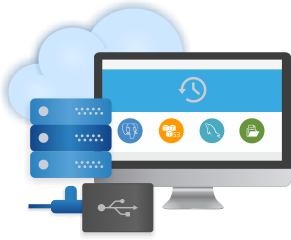 The Backup Service allows you to back up data from your server with root access to a Storage Box. Data deduplication eliminates the transfer of redundant content. This allows you to make optimum use of the storage space in your Storage Box. Use the Snapshots feature to take a snapshot of your Storage Box and restore it if necessary. This increases the reliability of your data. You can either create snapshots manually or have them generated automatically based on your own personal configurations. You can use various access protocols such as FTP, SFTP, SCP, and RSYNC so that you can easily and securely access your Storage Box. You can even integrate your Storage Box into your own file system via Webdav or Samba. Storage Box – service of customer data storage (such as backups) on our servers. Our customers always have access to the required information. This is the best option if there is a large amount of data that is needed to multiple users simultaneously. This services allows to make possible a maximum confidentiality of the data, because they are always isolated from other customers’ data. We provide a lot of options to ensure a secure customer access to his data. Using hard drives in a RAID-arrays, so the access speed and reliability are at the highest level. The service is ideal for any business that needs to always have a backup of website or other information. + What is a storage box? + How will my data be available? Data will be available for several protocols designed specifically for their transfer — FTP, FTPS, SFTP, WebDAV. Absolutely safe. These different clients on the backup server are completely isolated from each other. Absolutely reliable. Availability of our service average of 99%. At the same time themselves on backup servers, we use hard drives assembled into a RAID-array, to minimize the risk of data loss. + How do I configure the backup? Many server control panels allow nominally configure backups to a remote server. If this option is not suitable, please contact our support. + What pricing plan to choose? We have created service plans so that they come for a variety of projects, and the client can get a reliable service without any overpayments. If resources require more or less, you can switch to another rate. Of course! If you order services for a longer period, its monthly cost is reduced. + How to buy a storage box? It is not difficult. Pick a suitable pricing plan and click Buy. After checking into our billing system and payment, your storage box is ready for operation within a few minutes.